The factors to stay healthy have not changed over the years and remain fairly obvious. They include not smoking or chewing tobacco, getting consistent exercise, following a healthy diet, controlling your weight, and getting annual check-ups with your doctor. 1. 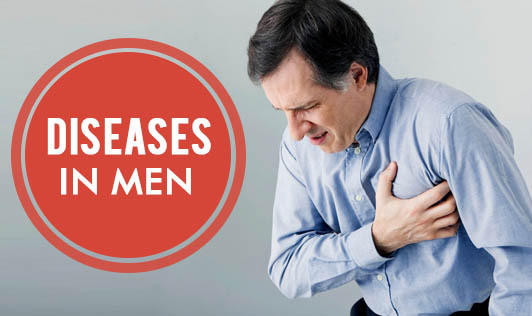 Heart disease is the greatest health threat to men. However a healthy lifestyle can prevent heart disease. 2. Cancer - The most common cause of cancer death for men is lung cancer and prostate cancer. About one-third of all cancer deaths are related to nutrition or other controllable lifestyle factors. 3. Stroke is also one of the leading causes of disability. 4. Accidents (unintentional injuries) like motor vehicle accidents and poisoning. 5. Chronic obstructive pulmonary disease (COPD) is a term for a group of chronic lung conditions including emphysema and chronic bronchitis. The main cause of COPD is smoking, and it's strongly associated with lung cancer. The majority of these conditions are very preventable by leading a healthy lifestyle, getting regular checkups and paying attention to your environment. With improvements in technology and medicine, life expectancy continues to increase. However, without the individual taking care of his own health, no technology or medicine can have an impact.